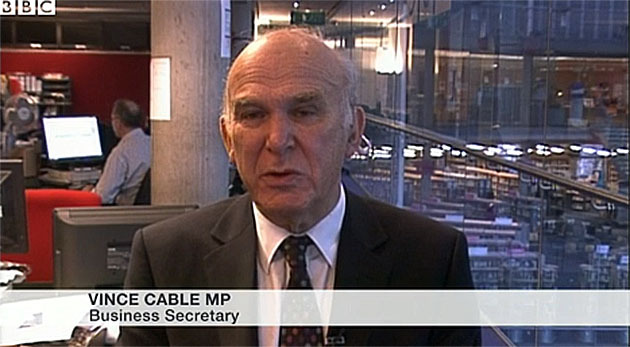 TheBlueGuerilla: Cable Sparks Coalition War. As predicted on TBG yesterday, Business Secretary Vince Cable last night sparked a war in the coalition with his views on the EU. Hot-on-the-heels of Tory MP James Brokenshire earlier giving a profoundly eurosceptic message, Cable accused the Conservatives in the coalition of "blighting investment in Britain" with David Cameron's pledge of an EU Referendum. As the party's spring conference gets underway in York Cable went on to say that big firms will "look elsewhere" if access to the EU jobs market is "jeopardised". David Cameron says he wants a full renegotiation of Britain's relationship with the EU but, TBG understands that his plans may hit the buffers if he has to form another coalition with the Lib Dems after the 2015 General Election.